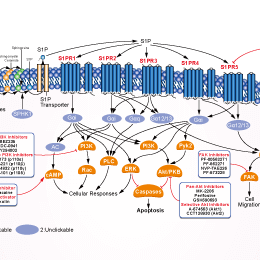 SKI II is a highly selective and non ATP-competitive sphingosine kinase (SphK) inhibitor with IC50 of 0.5 μM, while exhibiting no inhibitory action on other kinases including PI3K, PKCα and ERK2. D, representative merged IF images with DAPI nuclei staining (blue) in untreated (“Ctl”) and CoCl2-treated cells without (“Veh”), and with SKI-II co-treatment. Scale bar = 30 μm. N=5 independent samples per group. oligodendrocytes(defined by MBP immunoreactivity, red), oligodendrocyte progenitor cell(defined by NG2 immunoreactivity, green). PF-543, a novel sphingosine-competitive inhibitor of SphK1, inhibits SphK1 with IC50 and Ki of 2.0 nM and 3.6 nM, exhibits >100-fold selectivity over the SphK2 isoform. (C) Western blot analysis of mature TGF-β1, FN and Col-I protein levels in sham, sham+ PF-543, UUO and UUO +PF-543 groups at 7 days (n =3). (average ± SEM; ANOVA; *P < 0.05, **P < 0.01 versus sham group. #P < 0.05 versus UUO group). (D) Periodic acid-Schiff staning showed that tubular atrophy was evident in the obstructed kidneys at UUO 7 days after PF-543 treatment (n =6). (E) Masson's trichrome staining showed that matrix accumulation increased in the obstructed kidneys at UUO 7 days after PF-543 treatment(n = 6). (original magnification, ×400, scale bar =50 μm). Opaganib (ABC294640) is an orally bioavailable and selective sphingosine kinase-2 (SphK2) inhibitor with IC50 of approximately 60 μM. Phase 1/2. Macrophages treated with ABC294640 at concentrations of 0, 0.5, 1, 5, 10, 50, or 100 nM. Ratios of OD/OD (NC) are presented as means ± standard deviation. *p < 0.05 vs. NC group (1‰ DMSO). Fingolimod blocks antitumor immunity and prevents rejection of myeloma and B-cell lymphoma in TCR-transgenic SCID mice. (A) Id-specific TCR-transgenic (TCR-tg) SCID mice were inoculated subcutaneously with 1.6 105 MOPC315 myeloma cells and treated daily with either fingolimod (FTY720, Selleck Chemicals; 2ug/g bodyweight) or with vehicle only (0.8% DMSO; Sigma-Aldrich) delivered intraperitoneally. Tumor growth was followed by palpation. Mice were euthanized when the tumor reached 10 mm in diameter (n=14-17). (B) Id-specific TCR-transgenic SCID mice were inoculated subcutaneously with 1.6 105 F9 B-lymphoma cells and treated daily with fingolimod or with vehicle only. F9 cells are A20 B-lymphoma cells transfected with Id-containing L-chain from MOPC3157 (n=14-16). (C) Nontransgenic SCID mice were inoculated subcutaneously with 1.6 105 MOPC315 cells and treated daily with fingolimod or with vehicle only (n=8). JTE 013 is a potent and selective S1P2 antagonist with IC50 of 17.6 nM. Fingolimod is a sphingosine 1-phosphate receptor modulator used for the treatment of relapsing-remitting multiple sclerosis. Ponesimod(ACT-128800) is an orally active, selective sphingosine-1-phosphate receptor 1 (S1P1) immunomodulator with EC50 of 5.7 nM. Immunoblot of KMH2 cells following 1 h pre-treatment with increasing concentrations of Ozanimod or Siponimod.